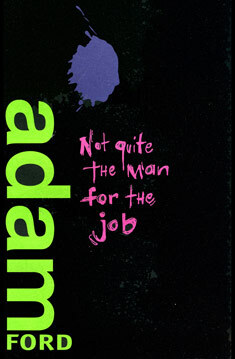 Not Quite the Man for the Job was my second poetry collection, published by the lovely folk at Allen & Unwin in 1998. It’s 96 pages long, full of poems about space-whales, superheroes, bicycles, frisbees, talking grapes, fucked-up goldfish and concrete fairies. It also has its own subject index. It won the 1998 REACT Top Young Adult Read award (the prize was a box of Guylian chocolate truffles, $50 and a certificate). It was also nominated for Age Poetry Book of the Year in 1998. Down the back streets on my grownup BMX. swaying as I stand on the pedals. by two pubs and two bands. but I’m high on something tonight. pushed aside by trees that got there first. and the chunk of changing gears. past places I could have had my first kiss. pulling leaves from the trees as I pass. dimples on the head of a Guinness. I’ve forgotten my longing for things past. They’re gone. They were good. That’s enough. Tonight there’s no need for “remember when?”. Tonight, I’m nostalgic for now. I have been trying to get my hands on a copy of “Not Quite the Man for the Job” for about 10 years. Everyone tells me it is out of print. Do you know how i can get a copy. Im happy to pay costs. Ah, yeah, it’s very sold out, I’m afraid, Maxine. The only book of mine that’s in print right now is The Third Fruit is a Bird. Sorry about that. Would there ever be a bind up of all your poetry? I don’t really know what a bind up is, but if you mean all of my poems in one collection then no, there isn’t, but that doesn’t mean there will never be! I know. It’s not the same thing. I know. Hey i have to analyse your poems ‘CHrist goes fishing’ and ‘If i could be a book’. could you please sum up what each of those poems are about in a sentence please. VERY URGENT!!! I was there as a high school student in 1998. Together my friend and I single handedly ensured it was given the (joint) prize. It made an excellent year 6 oral I understand, laced with profanity as it was. I have the book still. I stole this book from my high school library the year I left because I knew it was out of print. I took it back a year later. The guilt was unbearable. Oh, eClaire, that’s adorable! Well done for returning it. I salute your moral fortitude. haha. I wish I had stolen my high school library’s copy. I would live with the guilt my whole life as there is no way I would have given it up. I used this book as a means of getting the lowest Year 10 English class to enjoy poetry! It was a boys only class and they just loved your poetry. Thank you so much. I am retired now but I still expound the virtues of your poetry to anyone willing to listen. No, thank YOU so much! Just another fan of Not Quite the Man asking if you will ever get it re printed? and just yesterday I told someone about you and Recited Sweet Revenge to them. I’m blushing. Sadly there’s no chance at this stage of a reprint, I’m but there is an ebook out that let’s you carry the sucker in yer pocket wherever you go. The link to buy it is up at the top of this page. Have you thought about Kick Start or one of those. Well electronic may not be all that tactile but you can Pick up an ebook version these days – maybe that’ll scratch the itch? Yes I’ve got the ebook just working out all the platforms now. Did you know that readmill is closing down? I don’t know readmill. I’m still missing book.ish. Thanks for picking up the ebook – if you need help with the platforms let me know. Ah. I tend to read mine on ibooks. Are you a mac or PC user? I’ve never used readmill. Hi Adam, I just wanted to say a big thank you for your poems – particularly this collection. My husband received it as a gift and loved it. He passed away several years ago, and my son now enjoys your poems as much as he did. … I’m pretty sure the book hasn’t left my son’s room since he discovered it in year six, and he has managed to use one of the poems each time he has had a poetry assignment for school (he’s in year 8 now). So, thank you, not only for providing many hours of poetry readings at the dinner table for our family, but for helping my son find a link to his father who he lost far too soon. Thank you so much for this! I am very happy that you chose my poem to teach! I’m also very pleased by the phrase “embora, cretino egoista”!